120, although counts vary by sources. 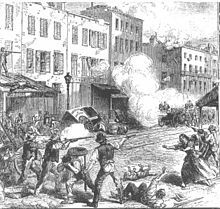 The New York Draft Riots (July 13 – 16, 1863; known at the time as Draft Week) were violent disturbances in New York City. They happened when anger with President Lincoln and his laws was highest. At first it just wanted to show anger at the draft. But the protests became violent and "a virtual racial pogrom, with uncounted numbers of blacks murdered on the streets". Major General John E. Wool said on July 16, "Martial law ought (should) to be proclaimed, but I have not a sufficient (enough) force to enforce it." The military stopped the mob using weapons. However, they had already destroyed many buildings, including homes and an orphanage for black children. ↑ "The draft riots in New York, July ... - Google 도서". books.google.com. Retrieved 8 June 2010. ↑ "Maj. Gen. John E. Wool Official Reports (OR) for the New York Draft Riots". Shotgun's Home of the American Civil War. Retrieved 2006-08-16. This page was last changed on 13 August 2018, at 04:20.